This clip-on device for a TV that pairs over Bluetooth with a joystick-style QWERTY keyboard sounds complex, but it's far from it. Archos's latest Apple TV challenger isn't going to win any design awards, but as a £99/$130 gadget that puts the Android smartphone experience on a TV, the Archos TV Connect could have legs. It might have been invented for smartphones and tablets, but Google's Android operating system has been used in everything from smart watches and cameras to in-car tech and 3D glasses. But what about the humble TV? 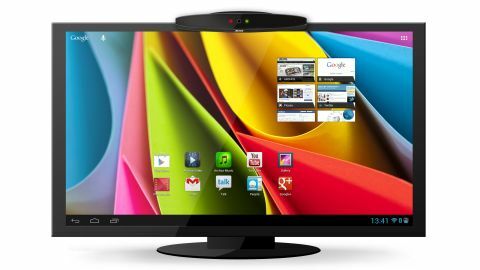 LG is about to unleash an all-in-one Google TV partly based on Android (with more coming thanks to its webOS purchase), but few will splash out big bucks for that; so step forward the TV Connect set-top box from Archos. Seeking to turn your TV into a smartphone in one swipe, the Archos TV Connect is about the same size - as well as price - as Apple TV. Of course, it's on the other side of the fence when it comes to the operating system, and that shows positively in the Archos TV Connect's bigger ambitions as much as it does negatively in its rather plasticky build quality. Fully certified by Google, Archos TV Connect is similar in design to a Kinect in that it clips onto the top of any HD TV (the proviso being that it must be able to cope with 1080p). Attaching via HDMI and sporting both Wi-Fi and wired LAN internet, it appears to grip the bezel rather well, and seems stable and relatively unobtrusive. It includes an 8GB Flash drive (though that can be extended to 32GB using a microSD card slot), a webcam and microphone, so Skype and its ilk are on the menu. Though it offers a completely open Android experience akin to that on a smartphone or tablet, at its core Archos TV Connect could prove to be all about getting smartphone games onto a TV. That's the suggestion from the second part of TV Connect: the TV Touch remote control. A gamepad in looks, though with a QWERTY keyboard on the bottom and an accelerometer inside, it's a bit of a handful in more ways than one. In something of an unusual move - and surely something to do with cost-saving - the controller includes analogue joysticks on each side in place of touchscreen gestures. It effectively means pushing your thumbs together when you want to zoom in on Google Maps - something we experimented with during our demo - mimicking what you would do when using a smartphone. The alternative would have been to include a touchscreen to allow 'real' tapping, pinching and zooming, which would have at least doubled the price of TV Connect. The gamepad is the product's weak point, since it just doesn't feel natural, and takes a while to get used to. But there are alternatives; the Archos Remote Control app works with TV Connect, and any CEC-spec (a universal spec for control) remote control will do a similar job. Meanwhile, the on-screen Android experience is navigated by that controller's cursor, which works in much the same way as LG's Magic Remote. With the two pieces of hardware linked via low-power Bluetooth, it's henceforth a pure Android 4.1 Jelly Bean experience, with TV Connect offering total access to Google Play apps. And we mean every app, including the ability to download your choice of web browser (Chrome seemed easy enough to navigate, with text entry a cinch using the keyboard), catch-up TV such as BBC iPlayer, YouTube and the likes of Facebook, Twitter and any Android video calling app. One of the key claims of TV Connect is the Archos Media Centre, which has for long been adroit with multiple video and music file formats. That doesn't change here, and it goes all NAS drive-like by monitoring particular folder's contents before pushing files - as they appear - to the TV Connect. Could TVConnect be a challenger to Apple TV? No, probably not (Archos tried this before with Archos TV+), and to call it its nemesis is perhaps being a tad too generous on the TV Connect. However, it's a great value idea, and certain to get some support from those intent on creating an low-cost Android ecosystem at home. Archos TV Connect will get plenty of competition from another Android-powered streamer, Netgear's NeoTV Prime, which builds-in Google TV, too - and plenty more will follow - but this is a good value gadget with an unrestricted, albeit slightly DIY feel.